Note: This is the first of a three-part presentation of Lórien screencaps, but only this post will contain an essay. I have relegated this discussion to the bottom, so that only those interested need see it. 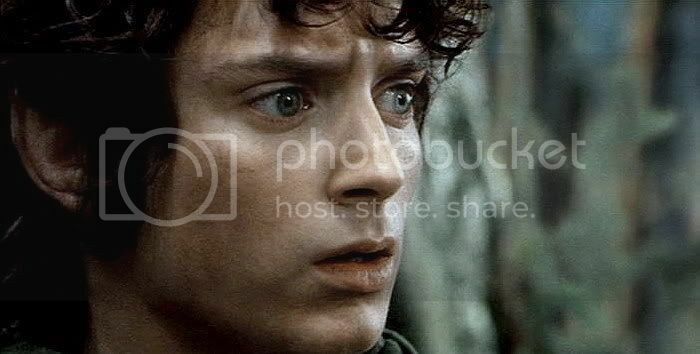 The Film Scene: Frodo Hears the Voice of Galadriel. ~ After traveling for some time, the friends reach the woods of Lothlórien, and enter it. Gimli Stay close, young hobbits. They say that a great sorceress lives in these woods, an elf-witch of terrible power. All those who look upon her fall under her spell…. Gimli: ... and are never seen again. Voice of Galadriel: Your coming to us is as the footsteps of doom. You bring great evil here, Ringbearer. 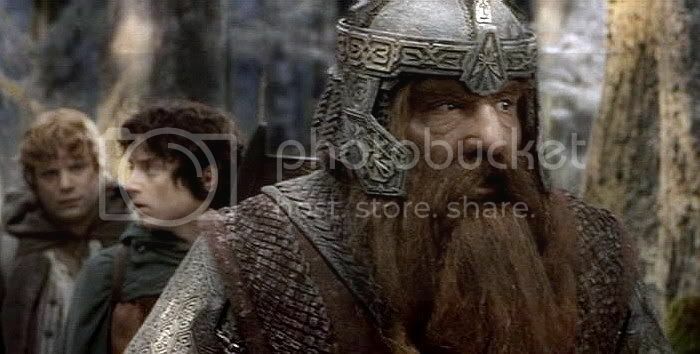 Gimli: Well, here is one dwarf she won't ensnare so easily. I have the eyes of a hawk and the ears of a fox! ~ Suddenly, they are all surrounded by Elves with drawn bows. Haldir: The Dwarf breathes so loud we could have shot him in the dark. As usual, the screencaps have been cropped and adjusted for brightness, contrast and focus. ~ as shown in the Lothlórien chapters of LotR. "Seeing is both good and perilous." ~ Galadriel to Frodo in The Mirror of Galadriel. There is no moment in the Tolkien story, entering the Golden Wood, in which Frodo hears the voice of Galadriel. Nevertheless, I thought the film scene worked extremely well. 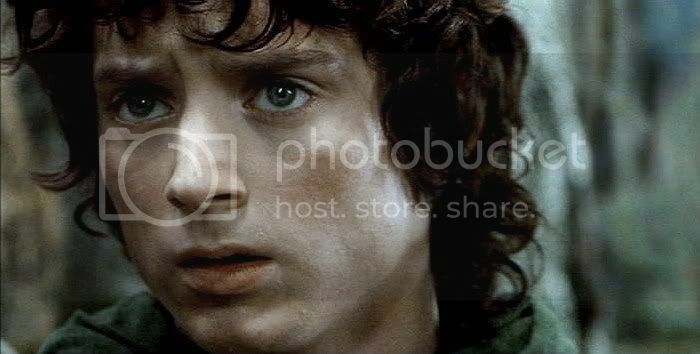 For one thing, Frodo is gorgeous in the shots. He’s Frodo at his best in these: both beautiful and manly. His expressive face could have come from the dramatic painting of the late Renaissance or early Baroque. Except for a few segments, film-Lorien is a night world: blues and violets, edged with silver and shadow. Galdriel’s glade is green, but a wet green, dark as the floor of a rain forest. 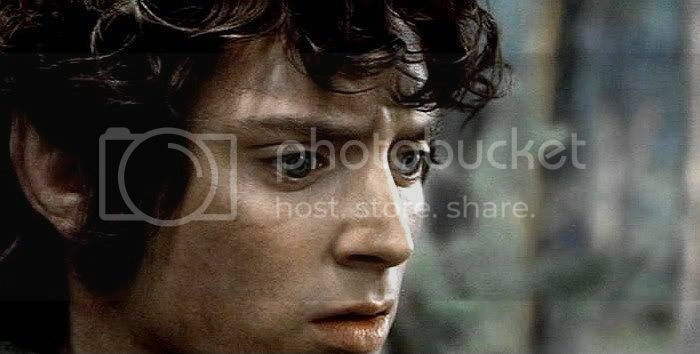 Another thing I appreciate about this film scene is that the telepathic communication depicted—when Frodo is able to hear Galadriel speaking to him in his mind—helps show, in its own way, that Frodo is possessed of specially heightened powers of perception. 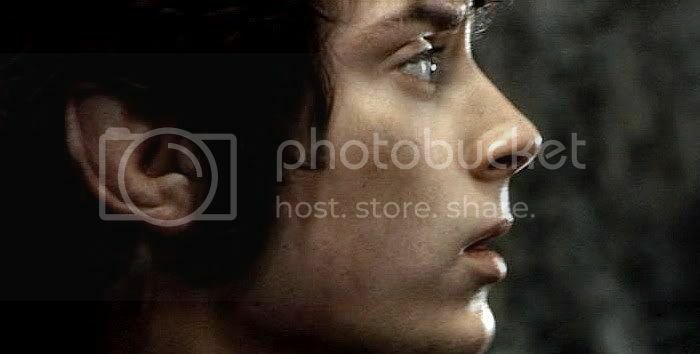 From the time of the wound from the Morgul blade, Frodo’s powers of perception and sensory acuity are noticibly increased. Gandalf remarks on the change in Frodo in Rivendell, noting a new translucency about him. 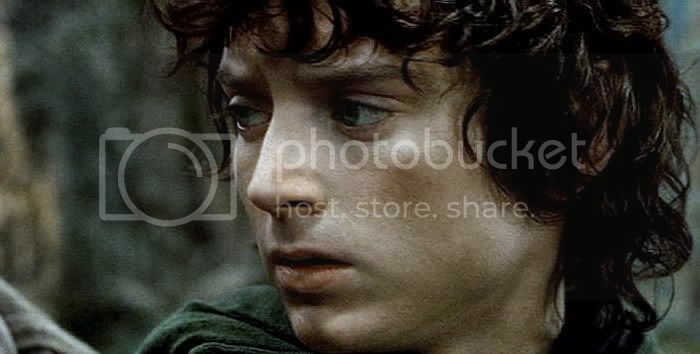 The Light within Frodo shines through the better, but, perhaps, if his physical being is more … permeable ... it also is easier for the Dark to be perceived, even to enter in. In The Mirror of Galadriel, Galadriel seems to confirm it. She tells Frodo that his senses of perception have been increased and changed, because of the Ring. The Ring is a dark instrument, but its effects are not all evil. [B]ut it cannot be hidden from the Ring-bearer, and one who has seen the Eye. You begin to see with a keen eye. 'Only thrice have you set the Ring upon your finger since you knew what you possessed. (...) Yet even so, as Ring-bearer and as one that has borne it on finger and seen that which is hidden, your sight is grown keener. You have perceived my thought more clearly than many that are accounted wise. You saw the Eye of him that holds the Seven and the Nine. And did you not see and recognize the ring upon my finger? 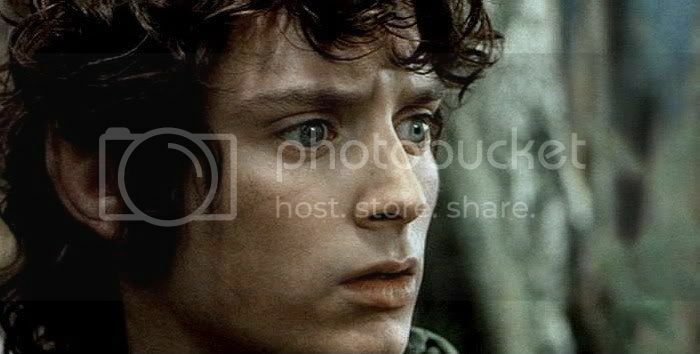 In terms of his physical senses, Frodo noticed in Moria that he could see and hear in the dark much better than he could before. After he has left Lothlórien far behind, he notices changes in his abilities in the Emyn Muil. His intuitive sense is keener, too. He begins to sense the Eye as a constant presence—without ever putting the Ring on—feeling it as an assault beating upon him, as a prying force trying to pierce the mental wall he struggles to maintain. He also is able to sense the good in the Emyn Muil, with this heightened power. 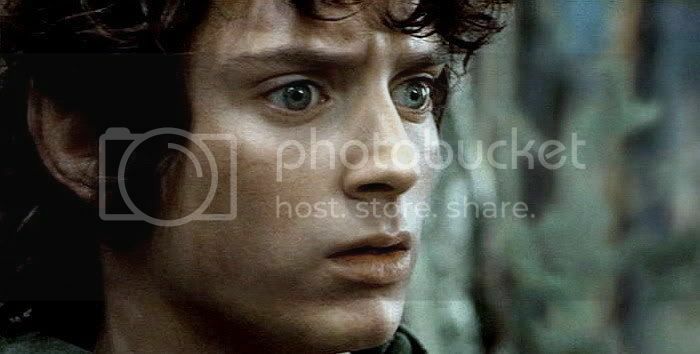 When he is stranded on a rock face, stricken temporarily blind by the cry of a Nazgul overhead, Frodo is terrified, unable to move. 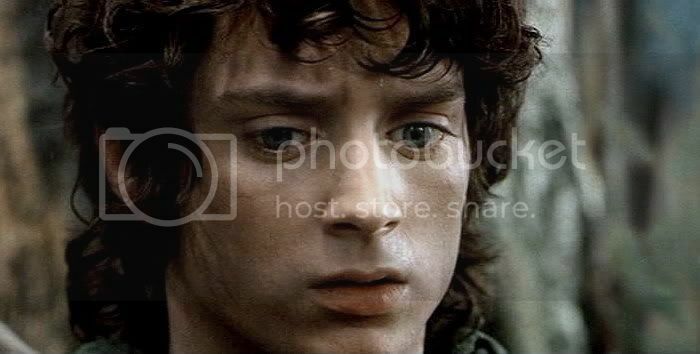 It is when the Elven rope, the gift of Galadriel, is lowered before his face that he is able to see again, the slender "life-line" emerging from the blackness as a silver thread, connecting him to Sam (and life), and a sign of hope. The Lórien chapters show Frodo’s increased sense of things already in place: both physically and at a deeper, almost mystical level—what I am calling "intuitive". But in Lórien he senses mostly good, not evil things. The book chapter Lothlórien portrays a much more involved entry into the realm of the Galadhrim, with vaster distances to cover (physically and psychologically), and more time spent traversing it. A major hitch occurs when Haldir intercepts them. Before they can proceed, because he is a Dwarf, Gimli must be blindfolded. At Aragorn’s command, the others allow themselves to be blindfolded too, since Gimli, feeling humiliated and incensed, refuses to cooperate. As they walk along thus, various members of the Company talk with Haldir. But Frodo is silent. The Company filed slowly along the paths in the wood, led by Haldir, while the other Elf walked behind. They felt the ground beneath their feet smooth and soft, and after a while they walked more freely, without fear of hurt or fall. 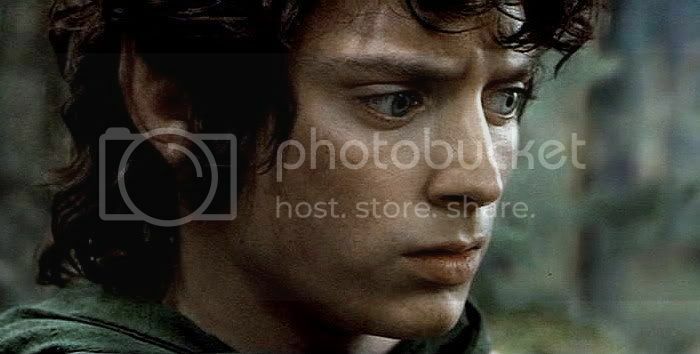 Being deprived of sight, Frodo found his hearing and other senses sharpened. He could smell the trees and the trodden grass. He could hear many different notes in the rustle of the leaves overhead, the river murmuring away on his right, and the thin clear voices of birds in the sky. He felt the sun upon his face and hands when they passed through an open glade. 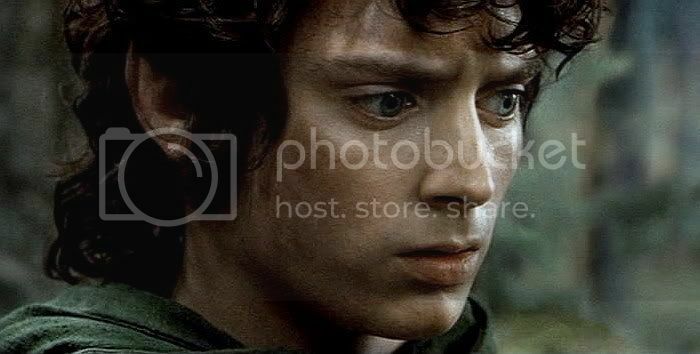 Frodo’s heightened senses might seem to be only the result of being deprived of sight, but there are other sequences in which Frodo's perceptions go deeper. Beyond what is available to his acute bodily senses, with his intuitive powers he becomes more and more attuned to the “other” quality—or ‘reality’—that flows under and through Lórien. For Frodo, a sense of the “otherness” of Lórien begins earlier, when he wades across Nimrodel, even before the Elves intercept them. When all the Company had crossed, they sat and rested and ate a little food; and Legolas told them tales of Lothlórien (…). ‘Do you hear the voice of Nimrodel?’ asked Legolas. Frodo was not “fancying” things, as it turned turns out, and Legolas could sense it. As soon as he set foot upon the far bank of Silverlode a strange feeling had come upon him, and it deepened as he walked on into the Naith: it seemed to him that he had stepped over a bridge of time into a corner of the Elder Days, and was now walking in a world that was no more. In Rivendell there was memory of ancient things; in Lórien the ancient things still lived on in the waking world. Evil had been seen and heard there, sorrow had been known; the Elves feared and distrusted the world outside: wolvers were howling on the wood’s borders: but on the land of Lórien no shadow lay. 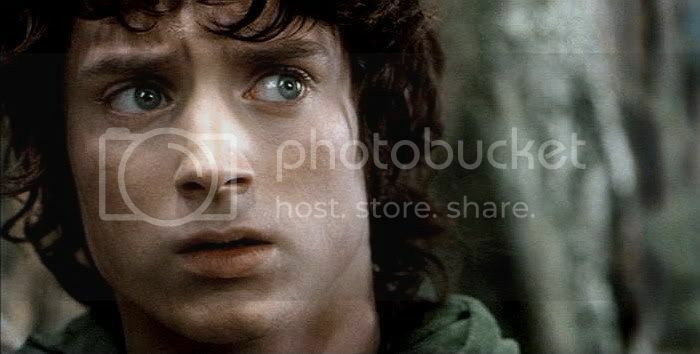 What Frodo is picking up is not something that is available to the physical senses, although it comes through them. 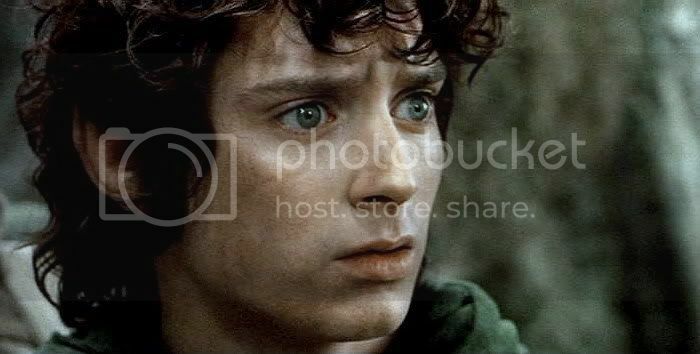 What is notable is the way Frodo hears and sees, as well as what he makes of what he senses. The others cast themselves down upon the fragrant grass, but Frodo stood awhile still lost in wonder. It seemed to him that he had stepped through a high window that looked on a vanished world. A light was upon it for which his language had no name. All that he saw was shapely, but the shapes seemed at once clear cut, as if they had been first conceived and drawn at the uncovering of his eyes, and ancient as if they had endured for ever. He saw no colour but those he knew, gold and white and blue and green, but they were fresh and poignant, as if he had at that moment first perceived them and made for them names new and wonderful. In winter there no heart could mourn for summer or for spring. No blemish or sickness or deformity could be seen in anything that grew upon the earth. On the land of Lórien there was no stain. Lórien: the land upon which "no stain” ... "no shadow" lay. It is the closest thing to "Arda Unmarred" remaining east of the Sea. The motif of Lórien as that which is untainted and fresh and immediate is repeated, as well as the sense of it as that which is absolutely ancient, primordial. These passages, more than any others in Tolkien, give me a sense of what it might be like for a mortal—for Frodo—to enter the Undying Lands. I receive these passages as glimpses of what Frodo will experience when he finally reaches Tol Eressëa. 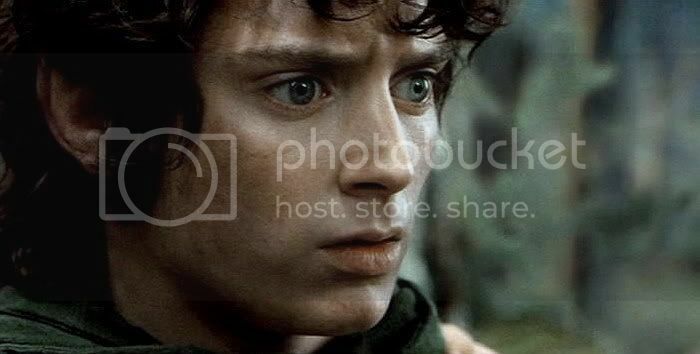 The next passage is the one that I think most strongly portrays Frodo experiencing his environment not only through heightened perceptions, but with specifically “Elvish” eyes. In fact, it is Frodo’s way of perceiving—not Elvish looks or a genetic ancestry that goes back to the fabled fairy wife—that I think constitutes his “Elvishness”. It is a way of perceiving that distinguishes him from his mortal companions. They entered the circle of trees. As they did so the South Wind blew upon Cerin Amroth and sighed among the branches. Frodo stood still, hearing far off great seas upon beaches that had long ago been washed away, and sea-birds crying whose race had perished from the earth. In the passage just cited, Frodo is shown having another of his insights into the dichotomy of Lórien (its extreme antiquity and its immediacy, its ultra-aliveness). But it shows something else. 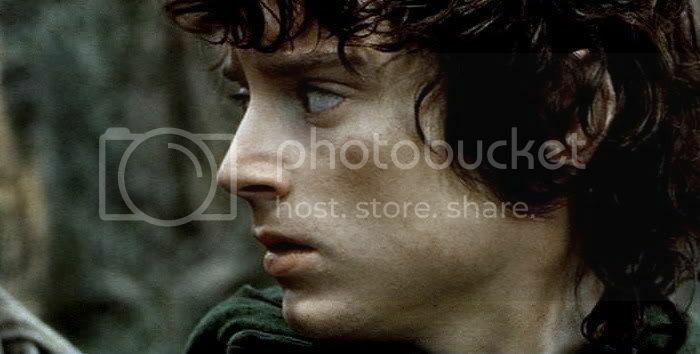 Frodo’s revelation while touching the bark of the tree has a strong parallel in another Tolkien story, Aldarion and Erendis, published in The Unfinished Tales. In that story, the attitude of Aldarion, the great mariner-king of Númenor, can be seen to represent the attitude of Men. That is, when Aldarion sees a tree, he sees a tree in terms of its potential for use. Sailing to Middle-earth, Aldarion is awed at the sight of the virgin forests there. But what sends his heart racing is not the sight of trees themselves, but the thought of the fleet he will be able to build from their wood. His wife, Queen Erendis, also a Númenorean of high birth, demonstrates an attitude towards trees that is closer to that of her Elvish forebears. The felling of the trees grieves her. She sees trees as beautiful and worthwhile in themselves, not primarily as the means to an end. The sight of Aldarion's ships returning to Númenor from Middle-earth loaded with hewn timber gives her sorrow. Her reaction demonstrates the Elvish viewpoint. The Elves, it is emphasized throughout the stories of Arda, see and appreciate the natural world as having its own life, beauty, and integrity. Men look at the same world and see resources: material to be used or brought under sway. So, in the passage quoted above, Tolkien is giving Frodo a specifically “Elven” perspective. Whatever may have been Frodo’s perceptions of the natural world before he took up the Quest, they are altered irrevocably, I think, by his time in Lórien—his experience there accentuated by the opening, deepening, and heightening of his perceptions from wearing and carrying the Ring, and his Morgul-wound. Frodo's "Elvishness" comes from a perspective he shares more and more with the First-born. 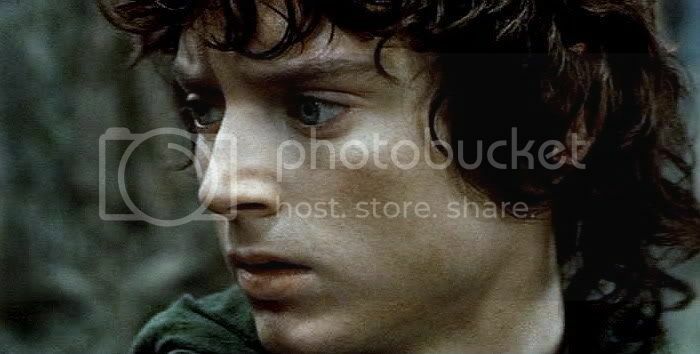 During the Quest, Frodo learns all the more to see, appreciate, and love things for what they are in themselves, not just for what they can be made of them or what they can be made to do. 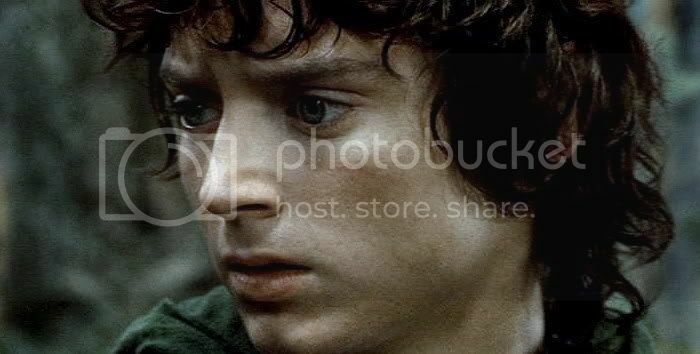 A bit more on Frodo's heightened perceiving, and its wider impact on his life. In the paragraph immediately following, from Lothlórien, Frodo is shown gazing at the Elf-city in the distance and the land beyond, outside Lórien. How and what he sees offers a comparison between the immortal and the mortal lands. It also implies a comparison between Frodo's newly-engendered feelings for the two realms. Frodo looked and saw, still at some distance, a hill of many mighty trees, or a city of green towers: which it was he could not tell. Out of it, it seemed to him that the power and light came that held all the land in sway. He longed suddenly to fly like a bird to rest in the green city. Then he looked eastward and saw all the land of Lórien running down to the pale gleam of Anduin, the Great River. He lifted his eyes across the river and all the light went out, and he was back again in the world he knew. Beyond the river the land appeared flat and empty, formless and vague, until far way it rose again like a wall, dark and drear. The sun that lay on Lothlórien had no power to enlighten the shadow of that distant height. Just as I feel I was shown a glimpse of what the Undying Lands would be for Frodo in the passages above, I feel that this passage foreshadows what it will be for Frodo to try to return to the Shire and his old life. 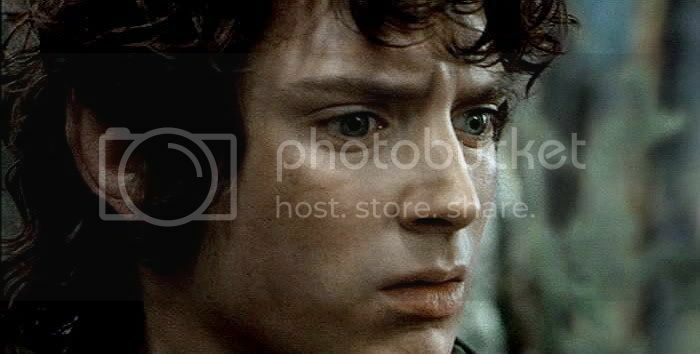 It’s not just the Ring-malaise that sends Frodo across the Sea. He is wounded, he is in pain, but it is not just that. 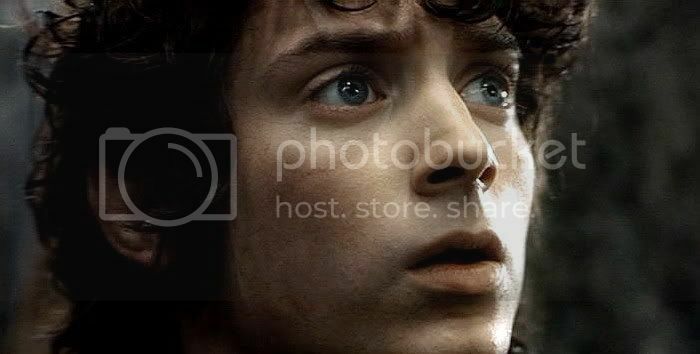 Frodo has seen too much, it is true, but not just of what is terrible, he has glimpsed too much of what is sublime. In the passage above, the land that Frodo notes as “flat and empty, formless and vague,” turns out to be southern Mirkwood, a land where the shadow has been creeping back. What interests me is that when he looks across the river and feels “all the light go out”, he experiences it as being “back in the world he knew”. This reminds me of nothing so much as Frodo’s remark at the end of Homeward Bound, in RotK. The hobbits are returning to the Shire, and Gandalf has left them for Bombadil's. The four Travellers are riding on the East Road heading towards the Brandywine Bridge when Merry speaks. "Like falling asleep," Frodo murmurs. How that reminds me of when he viewed the lands beyond Lórien—life-ages of experience earlier—and felt himself to be “back in the world he knew", that is, a land that seemed in comparison to Lórien "flat", "formless", "vague", "empty". The Morgul wound was just the beginning when it opened Frodo up—to both the wonderful and the terrible, his sight seeing more and more deeply. 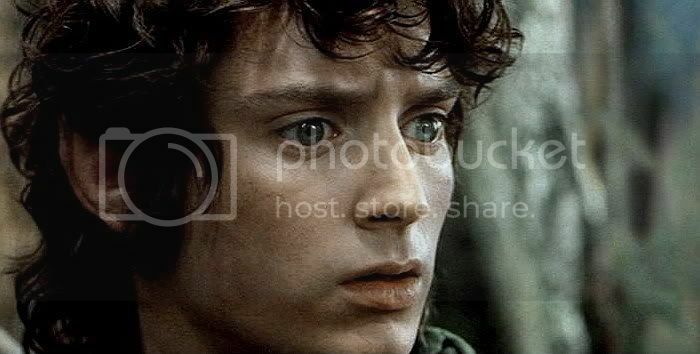 Many things are said about Frodo’s “Sight”. To me, the power of seeing that he showed in the Lórien passages is the Sight that matters: his acute powers of perception, tuned in to his environment at a depth level. It's not the ability to see the future, or to see what was happening to Gandalf in Isengard. The Sight that glimpses into the heart of the world’s reality is the greatest sight of all. Along with the Wise, Frodo seems to have had a share in it. 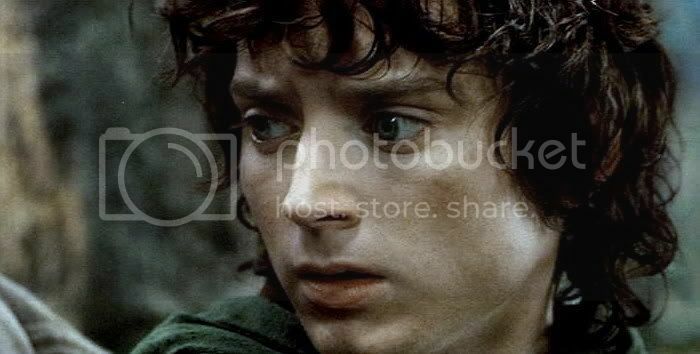 Perhaps Frodo's share in Elvish sight—by which I mean an Elvish way of perceiving—an Elvish aesthetic, if you will—is what struck people when they described Frodo as both young and old. The Elves, too, seemed to those who met them at once youthful and ancient. But such "Elvish sight" would have been very isolating for a mortal, since few or none would share it. The more I read his story, the more I see this as another reason why it was necessary, and inevitable, that Frodo sail into the West. ETA: My good Tolkien-and-Frodo-friend, jan-u-wine (the poet), because she is not on LJ and because she had a lot to say, wrote her comments to me in an email. The commenters to this post have been very generous, insightful, and gracious. Jan's thoughts, too, are insightful and gracious, but so fully-developed it seemed good to me to include them in the body of the the entry (rather than in three or four comment boxes). I asked Jan if I could post her comments in this manner, and she has consented. I have just finished reading your essay. Really, there are no words. You may not believe this, but many of these things I say in poetry because I can NOT say them as clearly and beautifully as you do in this essay, drawing the picture as a whole, then narrowing it until the conclusions emerge like charcoal turned to diamonds by the press of the earth. Linda, this is not only a well-reasoned and researched work, it is beautiful in its own right. Unlike most essays, which seem to regard anything short of something in need of KY as sacrilege (ie: dry to the point of pain), this (like its subject) flows with light and joy and love. 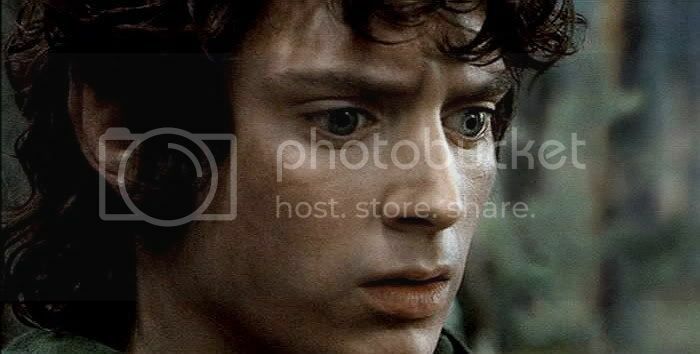 What an immense (though seeming-simple) thought, that all of these heightened senses were a result of the Ring and the Morgul wound—and, I should have to think, those in tandem with his own *Frodo-ness*—himself as he existed before-hand. He would not have become *thus* without the Ring and the wound, but neither would he have become * thus* if (for example) he'd been Samwise to begin with (though I daresay Sam would have loved to experience Lórien as Frodo did). Viewed in that way, there was a bit of bitter-sweet good in the Ring. Of course, he'd not have missed the heightened senses, and the lovely things he knew as a result, had the Ring never come to him. I very much agree with Erendis' view of the natural world. Although I note that we ( I include myself) don't grieve SO much that we disdain to use (for instance) wood to build houses or make paper of. But I suppose it is in the attitude one shows, as well. Are we "spendthrift" with the beauty of the world—do we count it as Erendis' husband did? 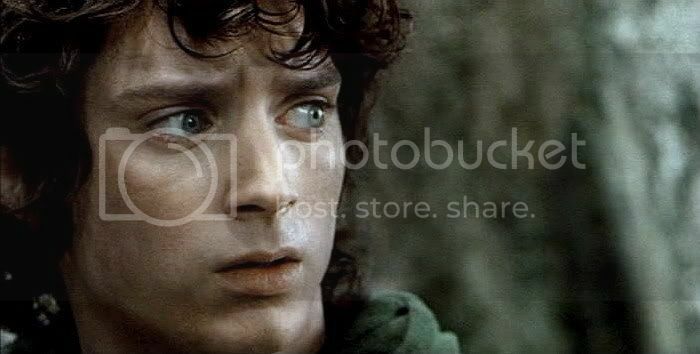 Or are we like Frodo, growing all the time into an ever more perceptive being that sees and appreciates and loves every single atom that is life, just FOR the fact that it lives and was joyfully created and part of the Song, equally, with us? I loved your point about why Frodo must go over-Sea....not because (or not only because) he has known "evil", but because he is, in fact, a different creature, marked as much by his foray into that which is *Beautiful* beyond thought as that which is *foul* beyond measure. In every way except the physical one, he could not "go Home again". I often have wondered just what exactly he meant by "it feels like falling asleep again". I only knew that it made me profoundly sad. But I think you've hit upon it. Like the "napping" Ents, for Frodo to live in the Shire again, he'd really have to go back to sleep: he'd have to *unlive* not just the bad memories, but he'd need to forget what else he'd seen.. And some of those things not only must have excited him in the moment, but I should think, being the vital, curious person he was, they would keep on calling to him. And, really, would he truly *wish* to give up any of his memories, since the experiences which made them up caused him to become the "educated" Frodo that Tolkien spoke of. He'd know little peace within the Shire. It had not changed, not really. It was he who was changed. I should think that made him love the Home he must leave more, like a toy that one no longer wants to play with (one being an adult, now) is looked upon with an even larger fondness than when it was played with as a "favorite". But it was a rather perfunctory, "memoried" love, wasn't it? It wasn't a love that would get him through the day. At the end of *those* days, it was (symbolically) the stars, and what they represented to him, that spoke. I wonder now if it were any coincidence that Arwen's necklace was star-like. In a sense, Frodo must "follow his star", mustn't he? And that star, I should think, would be Eärendil, the Mariner, whose journey was oft so like his own, and, of course, ends in the West..
"The Morgul wound was just the beginning when it opened Frodo up - to both the wonderful and the terrible, his sight seeing more and more deeply." "…the sight that glimpses into the heart of the world's reality is the greatest sight of all. Along with the wise, Frodo seems to have had a share in it." That very simple sentence doesn't, on the surface, sound like much: "glimpsing the world's reality". Most people probably think that they *do* this. But they don't, really, I think. It seems to me that we are always looking for the very *large* things to explain this world, and that is not really where the meanings and explanations lie. The world is elegant but it is also simple.. It is *plain* in its meaning. It wants to be understood. And therein, I think, lies the rub. We cannot see what lies before us, for we are looking for a "larger" truth. . We must make something difficult of what is * not*. And so we come the circuitous route to our understanding (if at all). I think Frodo was closer to this goal even before the Ring. The quest refined him, educated him. But it did not refine what was not already a fine (just untempered) metal. If the Ring was forged, well, so was he. And it is to his credit that he emerged, earthly flesh and all, the better and more beautiful for it. In the end, he found the simple truth that love, having it, giving it, receiving it, is the thread upon which the world is woven, the spark that ignites all that is good. During his time Over Sea,, after he had (as Tolkien says) learnt how to properly place himself in the framework of the grand story he'd been in, when he had made those few last steps in humility, how he must have rejoiced in seeing himself as a "simple" person, complete, at last, within an equally *simple* love. This essay is beautiful and I feel honored to have read it. Links to other LotR screencaps here. That's a lovely essay. 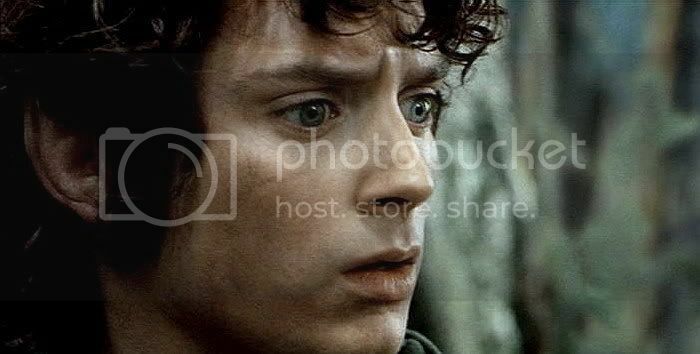 I enjoy reading all these examples of Frodo's heightened perceptions in one place. I have to say, however, that I hated that line of Galadriel's that Frodo heard in his mind, "You bring great evil here." Poor Frodo! After all he'd been through, what a discouraging thing to hear. Yes, that wasn't much of a welcome from the Lady of the Wood, lol -- and a great way to confirm everything that her detractors had to say about her in the world of Men. But both film-Lorien and film-Galadriel are very different from their book counterparts. It's plain -- and Fran/Philippa/Peter have said as much in interviews and commentaries -- that the screenwriters were always concerned to "up the ante" in every scene, lest the film drag or lack punch. 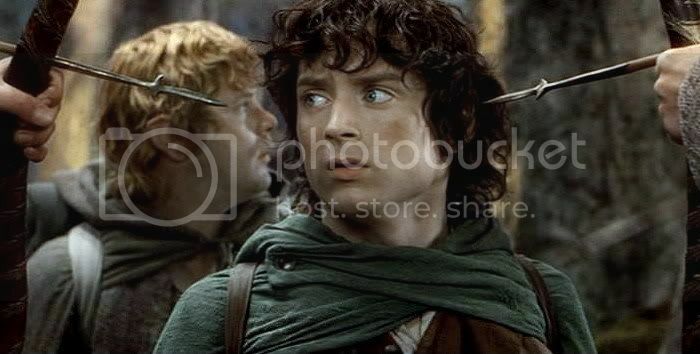 The trajectory of FotR the film was to catapault Frodo (& Co.) from one angst to angst, and life-threatening situation to life-threatening situation. This was to keep the dramatic tension at a maximum and (hopefully) make a moreengrossing film. The rhythm of the book story is so very different, alternating between tense or terrible scenes and scenes of respite and refreshment. The Lorien chapters made for a long and, I thought, beautiful time of enlightenment, healing, and refreshment for Frodo and the Fellowhsip. Film-Lorien was beautiful but shot through with a sense of danger. I am sure they meant to show the Elves as not storybook, but they did make them Not Very Nice. The Elves who resided with film-Elrond and Arwen were rather distant and snooty, but film-Lorien seemed plain dangerous. Film-Galadriel kept Frodo and viewers off-balance that way, alternating between hospitality and hostility. Galadriel terrified the velveteen breeches off Frodo every other minute, but gave him some good advice in between frights, and sent him off with a kiss, bearing life-saving gifts. 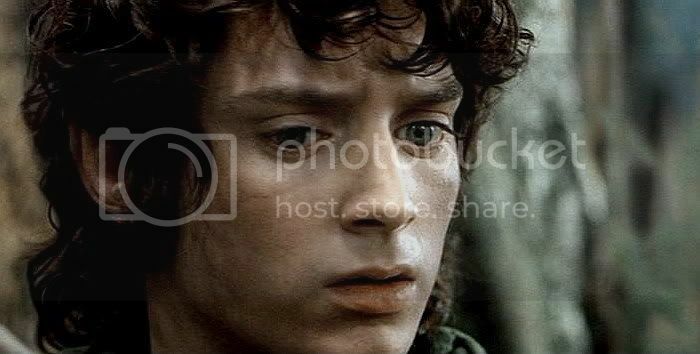 Film-Frodo made the acquaintance of a bi-polar sort of Galadriel, I guess. Maybe I'll talk about this in a later entry. Thanks for bringing it up, Shirebound! What a great essay! 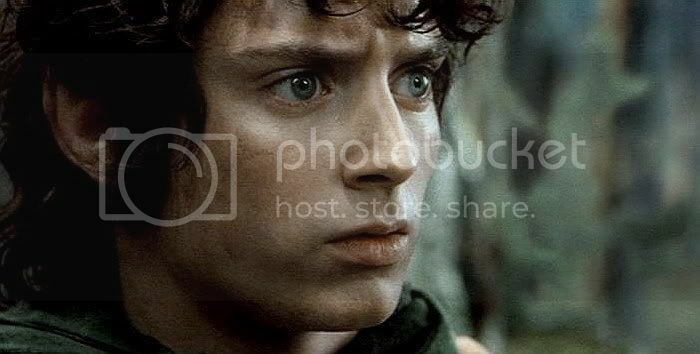 I love your perceptions about Frodo and his "Elvish" perspective. 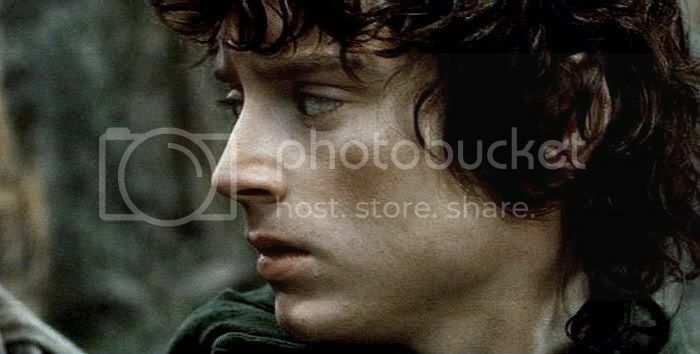 And of course Frodo is beautiful. As always. Thank you so much! Thank you, Claudia. You are gracious. I hope you enjoy the rest of the Lorien screencaps, though these are probably my favourites. I didn't do Galadriel's Glade since there are already so many screencaps made of that scene, but there are some nice ones among the sets to come. Thank you for that wonderful essay! I think you quoted all my favourite passages in these chapters. never before had he been so suddenly and so keenly aware of the feel and texture of a tree's skin and of the live within it. He felt a delight in wood and the touch of it, neither as forester nor as carpenter; it was the delight of the living tree itself. I love these lines; I can't touch a tree without thinking of them! :) And I've always thought that Frodo's marveling at the living tree was very close to his refusal to kill in The scouring of the Shire. Every life is precious to him. Ah, film-Frodo would have made Caravaggio weep. He would never have stopped painting him, detailing his beauty from the first plump-cheeked bloom of his youth to the bones and lines of his old age: still beautiful, but in a starker way. Aren't the Lorien chapters wonderful? They contain some of my favourite passages in the three volumes, many of which were quoted here, although in abridged form. Thank you very much, Mews! 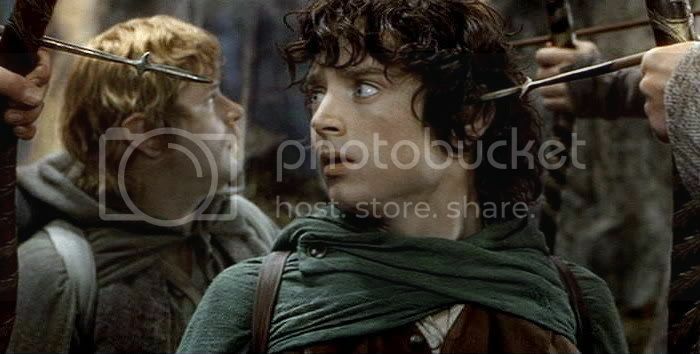 Not sure about in the book, but in the movie others besides Frodo have a heightened sense of awareness. For example, when the Fellowship stands in front of Galadriel, she talks to several of them through something like telepathy, and they understand her. What would you make of that? That's an astute observation, Primula. Yes, I am sure Galadriel can send thought messages to anyone, even if they have the perception level of a potato. But in that scene on the flet, she's standing right in front of them, giving each one intense eye contact. The way that plays on-screen, it's easy for the audience to think Galadriel (especially *this* Galadriel) is doing something *to* them, directly, entering their minds as if almost forcibly. I think that's fairly faithful to the book, in which they all reveal they felt she was reading their secret wishes and testing them. 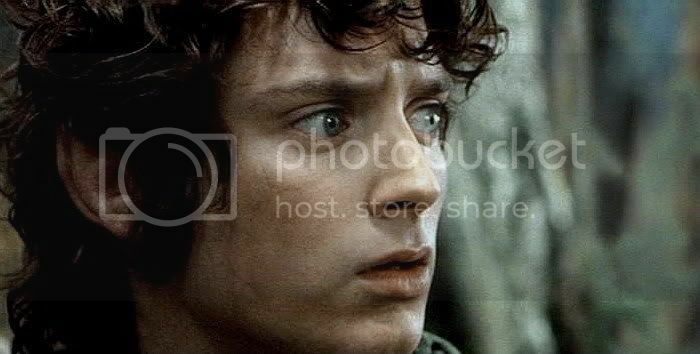 When Frodo hears her voice at the edge of the woods in the scene screencapped above, the voice from out of nowhere. She is not physically present. He reels, looking totally surprised, and does not seem to know whose or what the voice is, except that it's challenging him, accusing him. I have interpreted that as Frodo having specially acute abilities, like he's got a built-in tuner with really good reception. But you're right: the filmmakers could just as easily have shown this happening to Sam or Gimli or Boromir, if they had so desired, and viewers would just assume it was due to Galadriel's special powers of mental communication, not anything special about the hearers themselves. 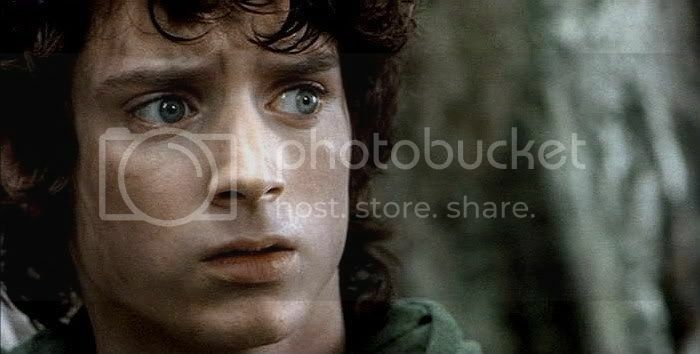 So I guess it's more a case of me watching the film scene, but reading into it things I already knew about Frodo's perceptive powers from the book. Another lovely set of screen caps and essay! Thank you, Melyanna! You are welcome. The Elves of Lorien are tricksie! This is a fantastic essay, Mechtild. The Lórien chapters are my favourites in the whole book, they're so mystical and beautiful. I've often re-read them almost in a devotional sense, I love them so much. It's as if Tolkien wrote them "in Runes beyond the craft of Celebrimbor of Hollin, shining like silver, filled with the visions and horizons" that opened in his mind (that's a quote taken from Letter 64, written to his son Christopher during WW2). I feel we see right into the heart of the Quest here. We see right into Frodo's heart, and Galadriel's ... and Aragorn's. In fact, we get glimpses of everybody's heart. Lórien is a pivotal episode for the Fellowship. It is here that the dark seed sown in Boromir's noble heart begins to grow. Momentous decisions will be taken after the Fellowship leave Lórien. I love what you say about Frodo and the Elvish aesthetic. I totally agree with your analysis of his 'Elvishness' and why it was both inevitable and right that he sailed West in the end. I've never seen his departure from Middle-earth as a sign of defeat. It's very sad, but it's wonderful too. He was blessed ... and I believe in the promise of healing that was made to him. The screencaps are gorgeous. Fantastic quality. Luminous. Like Frodo's face. Love that 'chiarusco' effect!! Very late Renaissance. Some fans were disappointed with the portrayal of Film Lórien as a night world of "blues and violets", rather than greens and goldens. But I can embrace both visions of Lórien: the book version, Lórien in sunlight, yet pulsating with ancient, primordial power ... and the movie Lórien, "edged with silver and shadow". The night vision mainly portrayed in the film gives an impression of a land of enormous power and mystery. Thank you so much, Pearl. I was hoping you'd see this, and hoping you wouldn't find it redundant. It was writing to you, more than two years ago when you agreed to be my new beta-reader, that I first began to develop this line of thought. At that time, Scarlet, who read the reflections I sent you, too (as co-beta), thought they would make a good essay. I said, "Someday." And here Someday is. I love the quote you lifted from Letter 64. It makes me want to read Letters all over again. Shirebound, reading through Letters, has been writing little reflections in her journal. This also makes me want to read them again. I agree that film-Lorien worked well. Like so many other things the filmmakers did, while they lost a great deal of what made the book scenes wonderful, what they did do helped created a look and mood that furthered the film story in a suspenseful, atmospheric way. I will need to come back and read the analysis later but just had to thank you for the pics - I could stare at that gorgeous expressive face all day. His face really is amazing in these, isn't it? I know we keep saying that everytime, but it *is*! The depths of your insights never fail to amaze me! Thanks so much... and for the lovely screencaps too! Why, shucks, Sam's Star. You're welcome! What an amazing essay. It’s awesome. I love this sequence in the books as much as in the films. Though Lothlorien is different golden and bright (in the book) / silver , blue and dark (in the film). The Lothlorien part – to me – is the heart of the book. It hit me like an arrow reading it the first time many many years ago and it still fascinates me. “In Rivendell there was memory of ancient things; in Lórien the ancient things still lived on in the waking world” – Description in perfection! I read your essay several times and I totally agree with everything. The screencaps are stunning. Looking at this young but mature face, the beauty, the vulnerability and the power. I’m looking forward to your next part (as always you left me speechless … your thoughts, the depth of them and the love for this incredible masterpiece … I can feel it, sweetheart). I once said – my life changed because I turned the pages … it’s wonderful to turn the pages in YOUR book, it makes me feel all the more alive. As I started to read this post I just leaned back, relaxed and listened to your words. Thank you so very much, mechtild. Gosh, Julchen, thank you! 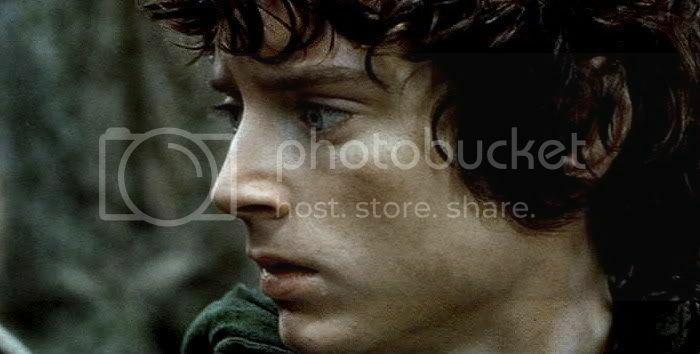 The next posts won't have that much to say, and the Frodo images are not as spectucular as these, but I hope you will enjoy them nevertheless. You said of these caps how stunning they were: Looking at this young but mature face, the beauty, the vulnerability and the power. That is beautifully put. They really are stunning. I never planned to cap them till the last time I watched the film. I stopped the DVD and pause-stepped though a few frames -- it was a scene I'd not paid special attention to before. Looking at those frames as still images, I was utterly WOWED. I love how you note the disparate elements that come together in that face: "power", "mature", "vulnerability". Yes, it's all that in one face. Thank you for this very thoughtful and perceptive analysis. Reading it has been like putting on spectacles; I could see what was there before, but not well defined; now it is clear and in focus. As for that face, quite apart from its sheer beauty, it never fails to amaze me how much expression there is in every single screencap. Thank you, Brummie. You are very kind! :) I've actually been thinking about this line of thought for quite a while; I just never had put it all together in one coherent, comprehensive presentation, either for myself or for other readers. As for the face, it is expecially jaw-dropping in these. A few people above have called for a Caravaggio to paint it. You have the ability to put a laser beam on a particular topic, open it up, and illuminate it greatly. You really have quite a handle on this sort of thing.. goodness! I feel that I understand (and appreciate) Frodo's 'Elvish nature' better than I ever have before. And it never occured to me that this would isolate him even more... of course it would.. when he returns to the Shire, no other mortals there have seen and felt all that he has... Sam certainly adores the Elves, but he doesn't take on the Elvishness, so to speak. Even the WALLPAPER is beautiful at this site! Mary! Thank you for stopping in and reading! But you are very naughty. 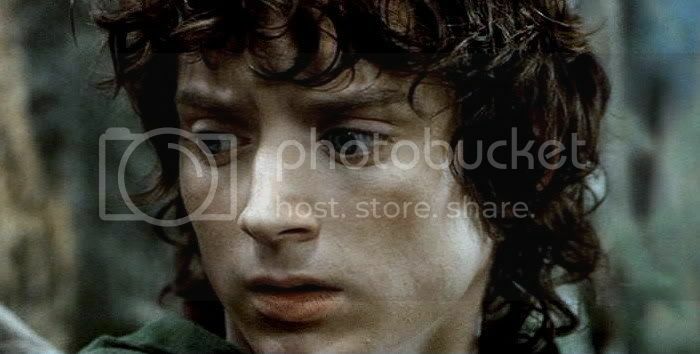 I know you are far too busy to be doing Frodo browsing. I haven't sent you links to manips or screencaps since before Christmas, as a special mercy to you, knowing how strapped you are for time. You are right, Sam adored the Elves, and had a strong feel for the quality of their world. "It feels like I'm inside a song", he said of it so well. But as demonstrated in the book scene of the Mirror of Galadriel, it is Frodo who sees the Ring Nenya on her hand. It is hidden from the eyes of all but the Ring-bearers. Sam, when asked, admits he had not seen it, thinking he saw a star between her fingers. 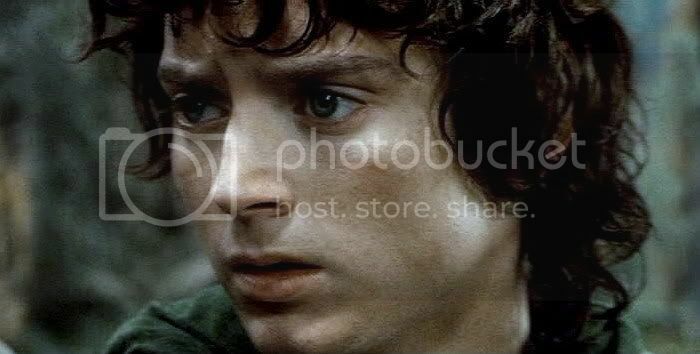 Bearing the Ring so far, and bearing the special wounds that marked him during the Quest, seemed to have set Frodo apart. He was not set apart in only evil ways, but he was set apart, none the less. Yes, this cap series is exceptional. That's our lad! And thanks for the comment on the new wallpaper (well, new since December). I love the way it looks. William Morris had such a great eye for colour and design. Thank you so much for this perceptive essay (no pun intended). The more I read about the Professor’s World the more I am struck with a feeling of reverence. What an imagination! Such beauty in the written word! My paperback editions of 'The Lord of the Rings' are full of notes, scribbled in all the available places I can find. You should see them lol! – Your screen-caps are a delight for the senses. They are the, most beautiful, Icing on the Cake. Thank you once again, Mechling. Saved on a flash drive! That sounds so super-heroish, Este, I had to giggle. I know what they are, though. Ariel told me about them, and Glen and Rachel have them. I really should learn to use such things! They sound incredibly useful. My LotR that was in paperback I gave to a book drive years and years ago, thinking I was "done with all that". After I revived my passion for the books, reading the rest of Tolkien, Glen and Rachel bought me the three-volume hard-cover. THAT is now filled with pencilled-in notes, the pages stuffed with little slips of paper as markers and to make longer notes. But with my Christmas money I ordered the one volume collectors edition. I saw it at the bookstore, but ordered it for much less on Amazon. It's supposed to be coming in May. Since the book is in print, I can only think they actually ran out of them -- the publisher -- and had to make more. I decided to go to a one-volume edition after checking our one-volume book out of the library, to see what it was like to read it that way. I loved it -- the index and appendices and all the maps were always available (instead of only in RotK), and it made my reading different. I really felt for the first time how truly LotR is one book, and not three. I'll make a post about it when I ever get it. I really loved your essay, and I saved it for a more in-depth reading. The are so many reflection hints and all very challenging. In Lothlórien there is the awakening of Frodo to a new reality concerning the true essence of both things and living being. He perceives the core of earth, or as you beautifull wrote its extreme antiquity and its immediacy, its ultra-aliveness. This is an unique experience in Middle-earth for Frodo, I think he perceived, similarly to Elves, the power of Iluvatar Song underpinning his creation. You are right, Frodo had to leave Middle-earth to embrace again this experience. Thank you for your stimulating essays, Mechtild. Thanks so much for reading and responding, Estelanui. I always look forward to your thoughts. 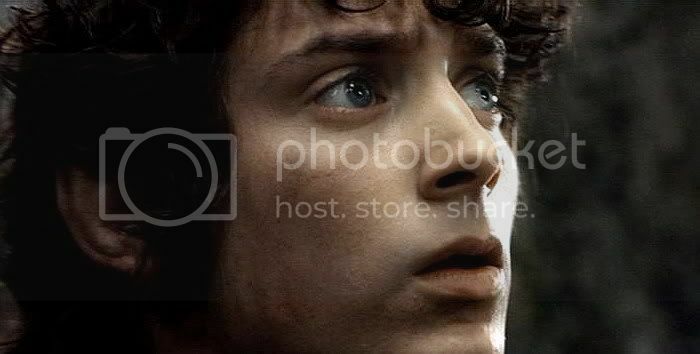 This is an unique experience in Middle-earth for Frodo, I think he perceived, similarly to Elves, the power of Iluvatar Song underpinning his creation. This is most certainly true, or so I believe. I want you to know, too, that I just added a mini-essay after you posted, a response emailed to me my friend, Tolkien conversation partner and sometimes collaborator, the Tolkien poet, jan-u-wine. She's awfully insightful and says some excellent things in it. It was far too long (and good) to break up into a bunch of comment boxes, so I told her I'd post it in the entry, if she wouldn't mind. You may want to come back and read it.